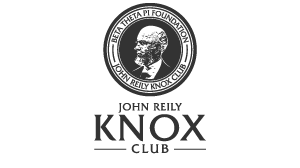 The John Reily Knox Club is the premier annual giving club of the Beta Leadership Fund. You can join the Club by giving (or pledging) $1,500 or more to the BLF in a single year, and membership includes a special invitation to the annual John Reily Knox Club Recognition Dinner at Beta's General Convention. Join the 300+ Betas and friends who impact the lives of our young Beta's across North America with their generous annual gifts of $1,500 or more. Program: Includes insider updates on the impact of the Beta Foundation and recognition of all John Reily Knox Club members. Questions: For general questions, please contact David Greis at the Administrative Office.